Mata Ortiz artist Jerardo Tena Sandoval will be on hand for this weekend's three-day workshop and exhibit at the Santa Barbara Boys & Girls Club. Acclaimed Mata Ortiz artist Jerardo Tena Sandoval and local potter and studio owner Rebecca Russell will host an exhibition and workshop that celebrates these world-famous ceramics at the Santa Barbara Boys & Girls Club starting this Friday, March 8. Mata Ortiz pottery hails from the small town of Mata Ortiz in Chihuahua, Mexico, located approximately 100 miles from the U.S. and Mexican border. Inspired by nearby remains of pre-Hispanic pottery, the artisans of Mata Ortiz began to recreate and craft these ceramics during the early 1970s. During the exhibition, master Mata Ortiz sculptor Jerardo Tena Sandoval will lead a two-day workshop on Mata Ortiz pottery-making, where participants will design and take home their creations. 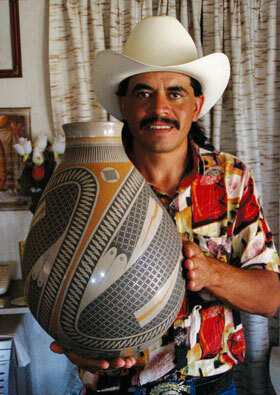 Along with the workshop, Sandoval will also give a free demonstration on Mata Ortiz pottery. A descendant of one of the original Mata Ortiz artisans, Sandoval is no average potter — his work has been showcased at the Hearst Museum of Anthropology and the University of California at Berkeley. At the annual Juan Mata Ortiz Concurso pottery competition, Sandoval has won several first place titles in categories like animal sculpture and new design. When he isn’t competing, Sandoval leads Mata Ortiz classes and demonstrations in cities like Mexicali and Ensenada, as well as at arts centers and community colleges across California. For workshop registration or more information, contact Rebecca Russell at (805) 708-1637 or rebeccajorussell@gmail.com.